Netbiter makes it simple to view your power meter data from a remote location. This week I had the task of setting up a power meter and monitoring this device remotely, via a Netbiter EC350. I found it quick and easy to do. 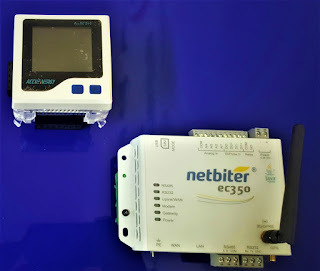 The Netbiter EC350 shown in figure:1, is the hardware component of the Netbiter remote monitoring solution. 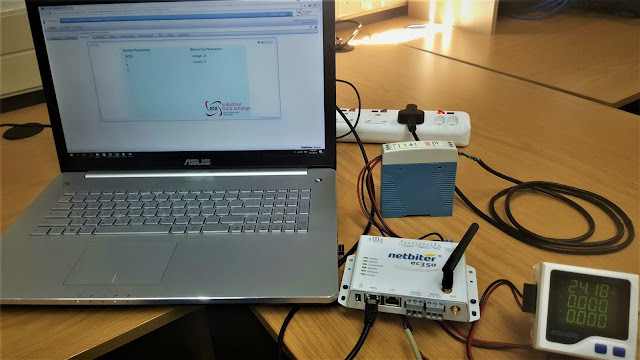 The gateway(EC350) can connect to a measuring device/field sensor via the following connection methods: Serial RS232 or RS485, Modbus RTU or TCP, or EtherNet/IP. In my setup I have used RS485, which is what both devices use. Both devices also needed a 24Vdc power supply shown in Figure:2 below. The Netbiter uses a cloud service called the Argos to store data that may be remotely accessed later on. The gateway automatically performs data exchange via an Internet enabled Ethernet connection (WAN) or local cellular networks to the Argos cloud service. In my setup, I have used the Ethernet port to perform data exchange to the Argos cloud. The method of using a cloud service data eliminates the use of public or fixed IP addresses and removes the complexity of VPN tunneling. Apart from this, the Argos service also features an authentication login process. It's possible as the main administrator to grant rights and privileges accordingly to specific user profiles. Both my Netbiter EC350 and power meter are powered in parallel using the 24Vdc power supply. The power supply is powered by 220Vac. Take note of the polarity of the device terminals as DC voltage will not work in the reverse polarity. The gateway is then linked via the RS485 com port, to the power meter. Note that the cable needs to be serial specific, and the connection points (A & B) need to be like for like and not inverted. if multiple slaves are used then the com ports will be series to each other. My Ethernet cable is connected to the WAN port of my Netbiter and the other end is connected into an Internet enabled data port. Based on the manual - the input terminals may be wired according to their specific measuring point. In my example I chose to measure voltage which was wired into the available polarity conscious input terminal on the power meter. Once my wiring was complete, I then logged into my Argos profile and add the Modbus registers as parameters in a template. The information needed for adding these registers are found in the power meter's manual. By using a template, I can install more units and export/import the same template to other various common applications. Eliminating redundant work, and making commissioning easier. Since the Netbiter EC350 acts as a Modbus Master in this network, I needed to add the power meter as a slave device onto the Netbiter EC350 under the configuration tab. In this step, I also specified that the template needs to be allocated to this device. Now that the device is added, I check the communication settings (baud rate, parity, etc) and make sure they correspond to the default of the manual, or I could edit the system parameters on the meter and customize them to what I need for my network. After my system checks are done, I download my configuration to the Netbiter and I am now able to browse the device parameters (an option available by the Argos service to present data without configuring a dashboard). Once I see data coming through I compare this to the power meter shown in figure:2. Since the meter provides a local display, I could verify that my readings were accurate. Now that the device has been confirmed, I then added the parameters to the visualization tab and created a simple dashboard, to present the data in a customized format. I also set up a logging graph and alarm list, to track the behavior of my measured values. I could also extract historical data and reports if needed. The power meter has functionality to read and write registers, so apart from only reading input values, I could remotely access the writable registers, for example: system parameters like the baud rate or device password can be changed remotely.